If you are a regular reader of my blog, you will know that from time to time I like to visit my local Chinese supermarket. It’s a great source of ingredients that you wouldn’t find elsewhere. On my latest expedition one lunchtime, I came across a packet of dried kiwi fruit. I love seeing dried fruits and wondering what I could pair them with. 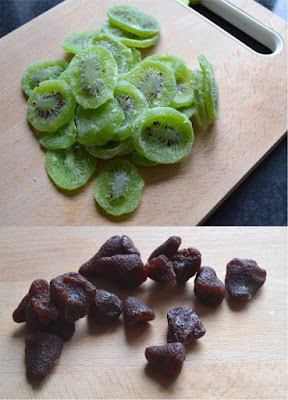 The dried kiwi looked lovely in it’s pack, all glistening green with black specks in the centre. I decided that strawberry and kiwi are always a good pairing and luckily I had purchased some dried strawberries in Holland and Barrett a while back – ideal. I got my Optimum 9400 blender from Froothie out of the cupboard and set about measuring the ingredients. I whizzed up the kiwi and strawberry and it was a little dry, so I incorporated a bit of coconut oil into the mix and it became the perfect consistency. If you are looking to buy a blender, I can't recommend the Optimum 9400 highly enough - click on the link to purchase one. I rolled the ‘dough’ from the blender into little balls which I then dusted in some desiccated coconut, as they were a bit sticky. I popped them in the fridge to chill for a couple of hours and then Disneyboi and I shared some later. These are perfect little balls of energy for a pre-workout boost, but actually taste like gummy sweets which kids and big kids like us would enjoy regardless of the fact they contain nothing too bad at all. They taste very sweet and would convert anyone who doesn’t think they like ‘faffy’ health foods. I’m loving this healthier ‘baking’ at the moment and will have to see what else I can come up with. Perhaps another trip to the Chinese supermarket is back on the cards! If you can’t get hold of dried kiwi or strawberry in your local shops, they are easily purchased online. 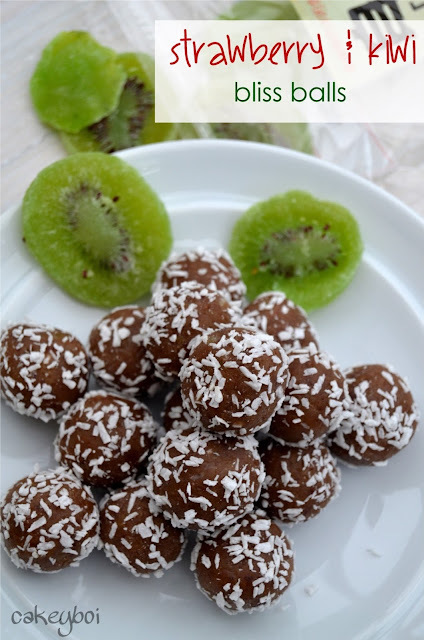 Place the kiwi, strawberries and coconut oil in the blender and whizz until they form a ‘dough’.Remove from the blender and form small balls, rolling between your hands.Dust the balls in a little desiccated coconut and chill in the fridge for a couple of hours.Enjoy! Prep time: 10 mins Chill time: 2 hour Total time: 2 hour 10 mins Yield: 16 balls approx. Disclosure Statement: I received the blender from Froothie, free to review. Any opinions expressed are my own. These look great Stuart! Such a simple yet fab idea. I love moseying around Chinese supermarkets, too. I never leave empty handed. I will have to look out for the dried kiwi - never seen that. Or I might put some in the dehydrator. Home-dried fruit is amazing! I really wish I had a dehydrator Kellie - would be such a great gadget! I love these ideas you come up with. So easy and perfect running snacks for me. I've never seen dried kiwi, how interesting! These sound like they'd be really delicious - strawberry and kiwi do go so well together. The kiwi was a great find Becca. Love these fruity balls Stuart (no sniggering), dried kiwi sounds amazing and I really want a high powered blender! Ooh isn't dried kiwi beautiful. It doesn't lose its colour like I'd expect. These look fab and I've always wanted to know why I can buy dried strawberries. Pinned and on quest to find these dried kiwis just to look at - I mean I'll make the balls but I'll stare at the kiwi for a really long time - stunning. What a beautifully simple recipe, I'd really like to try making these. I've never seen dried kiwi before but it looks amazing. I reckon it'd be perfect for my kids' lunch boxes! Really simple and fast Katie, always good for busy folks.